Lied Lodge is located at Arbor Day Farm and, like trees in a forest, the lodge and the farm are firmly entangled in each other’s business. Both are operated by the Arbor Day Foundation n Nebraska City, Nebraska and are part of a 260-acre historic landmark dedicated to forest conservation that was once part of the estate of J. Sterling Morton, the founder of Arbor Day. It’s an unusual combination: a foundation with the mission to plant more trees (they’ve planted 10 million to date) that runs a fancy resort lodge on a farm and puts their “green” philosophy to work in just about every aspect of the resort’s operations. But will this matter to your kids? From a child’s perspective, it’s the tour of Arbor Day Farm that ends with the gift of a tiny tree seedling to take home that will appeal the most. And the walk through the woods — with stops to get entangled in a 20-foot spider web, climb to a 50-foot-high tree house, and play enormous wooden musical instruments under the trees — is worth the visit. Not to mention that the resort’s location near Omaha makes it a convenient and fun stopover on a big cross country road trip. Built in 1993, the massive Adirondack-style timber and stone Lied Lodge is a popular conference and wedding destination and, since it’s both fun and educational, it’s also a perfect place for families. Its heated indoor Olympic-size swimming pool and separate shallow children’s pool are open year-round and all the activities on the farm are just a short walk away. The entire lodge is heated and cooled by an on-site power plant that uses leftover wood from a nearby pallet company. The small amount of ash left from burning the wood is used for soil enrichment on the farm. Even the coffee in the restaurant is “green” and is part of the Arbor Day Foundation’s Rain Forest Rescue program that helps indigenous Mayan farmers protect their rain forest lands from commercial development. The restaurant uses produce from the farm’s gardens and the onsite cocktail lounge serves wine from grapes grown on the premises. The adjacent farm is one big playground for kids, and they have so much fun here they don’t even realize that they’re learning while they play. We started our explorations in the Woodland Room, a concentrated educational experience that Disney helped design about the importance of trees and conservation. It felt like we were in the middle of a shady forest with a high canopy of trees overhead, but a forest that had buttons to push and screens to engage with in the many interactive exhibits, along with a short film presentation featuring trees in the movies (think the speeder-bike race through the trees in “Star Wars: Return of the Jedi”). Then it was outside to the Tree Adventure that starts on a meandering woodland path right out of a fairytale. You come across all kinds of delights along the way — a series of little wooden boxes with tiny doors have been placed just at child height so you can sniff a variety of forest scents. Stand between two megaphones and pull them to your ears to amplify the sounds of the forest. 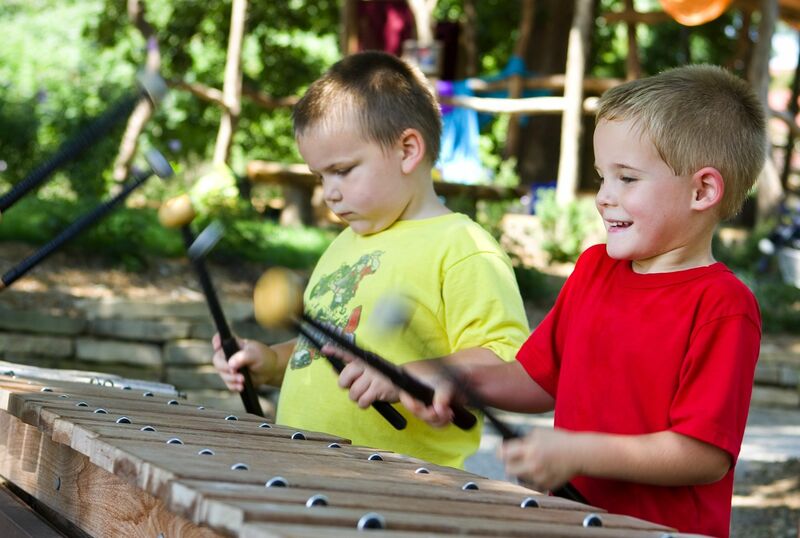 Stop at the “nature explore classrooms,” which are really outdoor zones of nature fun, like the giant wooden xylophone you can play; a waterway for building dams and sailing leaves and pinecones; and giant wooden blocks to construct whatever you wish. With all those trees, there are plenty of opportunities to climb. Most visitors linger at the top of the 50-foot-high tree house to enjoy the treetop view of the farm. 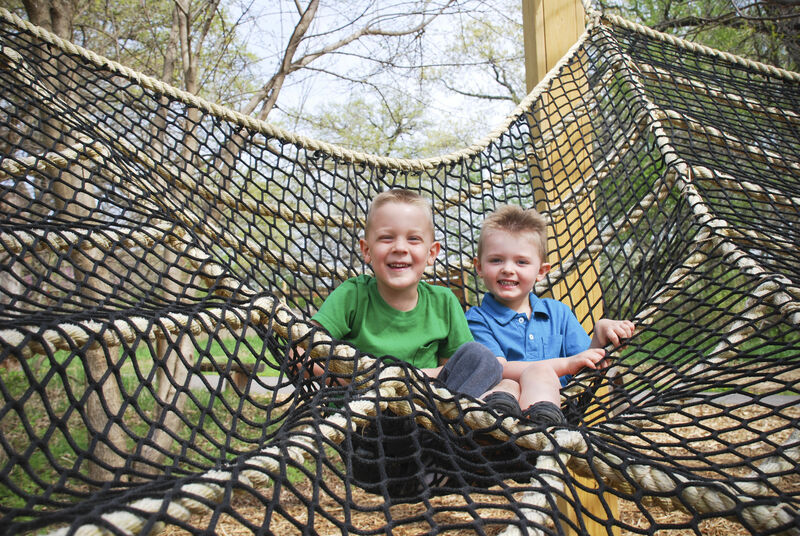 Kids of all ages love to scramble around the gigantic rope spider web. At the end of the adventure we stopped by the greenhouse to select our free tree to take home and plant. To see other parts of the property, you can take the Discovery Ride — a tractor-pulled trailer shaded by a gigantic leaf that takes guests around the gardens, farm and forest. Seasonal activities abound, such as apple picking, a corn maze, pumpkin patch, vineyard tours, gnome hunts, art in the woods and, as you might expect, elaborate Arbor Day activities. The Lied Lodge & Conference Center (800-546-5433) is located at 2700 Sylvan Road, Nebraska City, Nebraska 68410. It’s open year round and in winter, extra activities range from Wood Carving art exhibits to wine tastings, to being able to watch in February and March as millions of seedlings are shipped to partners in anticipation of Arbor Day plantings. The lodge is about an hour’s drive from the Omaha Airport and three hours’ drive from Kansas City, Missouri, making it an easy getaway for Midwestern families. If you’re considering a weekend at this restful place, the guest rooms run $109 to $283 per night; a variety of packages are available through the Lied Lodge website.